Please join us Saturday, April 13 at 10:30 am for a very special storytime with Tere Marichal! Tere is one of our island’s treasures. She is working with love and great care to promote our island’s folkloric traditions. Tere is also sharing her love of reading and enthusiasm for life through storytelling. You may have seen her on the beach with her traveling book stand, as she shares there, and at other venues throughout our island, books and storytelling. You can watch it here. 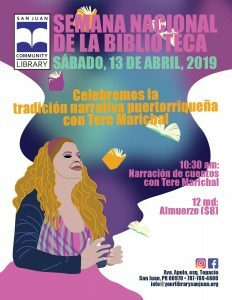 Come listen to Tere, and you and your family will be transported to another time and place. Storytime is for adults and children! Stay for lunch at 12 pm–there will be a cake, too, to celebrate National Library Week. And, following Tere, there will be a cello performance from one of our youth volunteers.